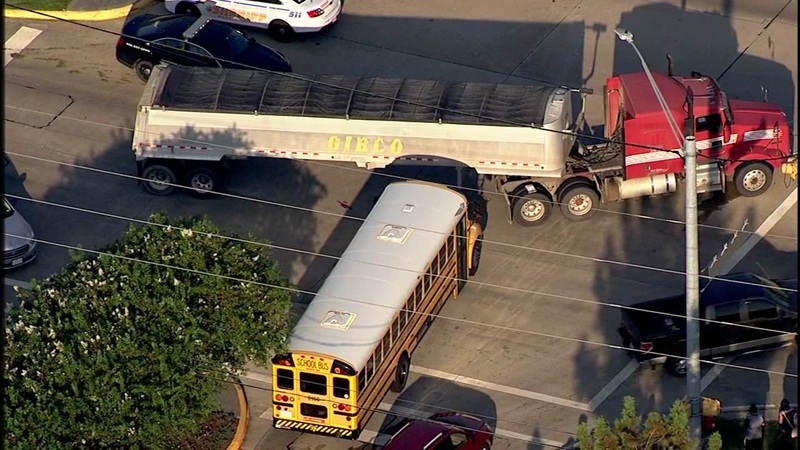 School bus crashes on Fry Road in NW Harris Co.
HOUSTON -- A school bus crashed into an 18-wheeler this morning on Fry Road in northwest Harris County. No injuries are reported. The crash happened in the 11800 block of Fry Road. Cy-Fair ISD says no students were injured in this minor crash. It's unclear how many students were on the bus that was headed to Smith Middle School. The school district says a car in front of the big rig stopped, and the big rig driver swerved to miss the vehicle and the rear of the trailer clipped the mirror of the school bus. The students were delayed getting to school, but no damage and no injuries were reported, the school district says.